A great way to brighten up your bicycle and the streets! Skirt Guards keep your skirt or your long coat from getting between the spokes of the wheel. 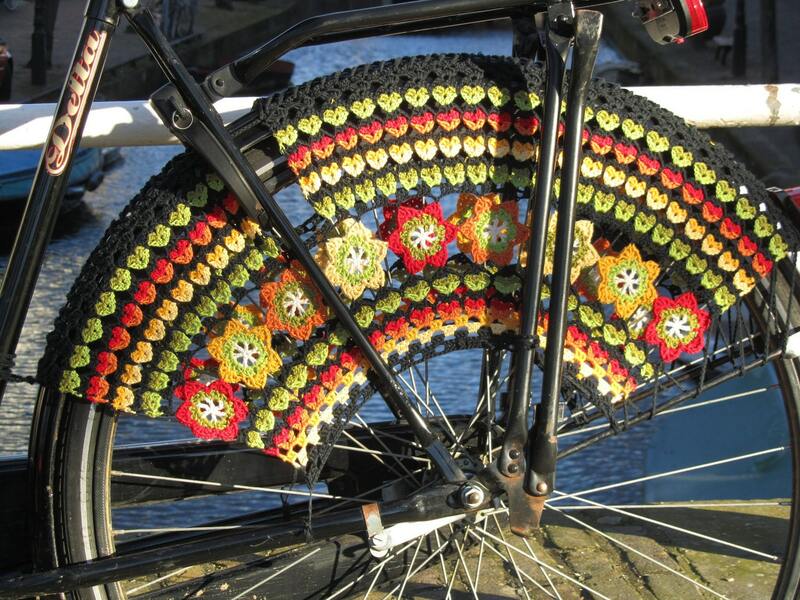 And it looks just great on your bike (you will never have trouble finding it!) They are made of cotton, and protected against water, dirt and grease. They are made for 26 or 28 inch wheels, and it is possible to make an opening for the lock on your bike. It is necessary that your bicycle has fenders, and it is easy to attach them. The pictures give you an idea of possible colour combinations. If you have something else in mind, please let me know; I'm sure I can make it happen! To finish your unique skirt guards, will take me 2-3 weeks. I LOVE the flower scarf and was excited that she created it exactly as I wanted. The flowers are so beautiful and colors are jewel like. Its the second piece I've ordered and will order again from her in the future. So beautiful and well-done. I get so much compliments. I have the most beautiful bike in town. I'm happy to accept Paypal payments. If you are not happy with your item, please let me know within 3 days of arrival. I will accept returned items and refund you your transaction, however shipping cost will be at your expense and refund will be issued upon receipt of item. I always ship to customers Etsy address, if your address is not current and your item has been sent there I will not accept responsibility for the loss. PDF-patterns are available as an instant download. All other items are sent in a sturdy box, with standard shipping (to keep the costs down). If you want to upgrade to 'track & trace', or for insurance, please contact me. I'm not responsible for any customs charges. As soon as your item has been shipped, you will get a confirmation. Patterns are for personal use! If you have any questions, or need help with a pattern, please let me know. If you have an idea for a custom order? You make my day!